Edinburgh Trams is looking for volunteers to help test crowd management procedures at the Murrayfield Stadium stop. Before going live, Edinburgh Trams is undergoing a number of exercises to test operational and safety procedures. The event on Thursday 13 March, named Exercise Salvador, will involve up to 1,000 members of the public. 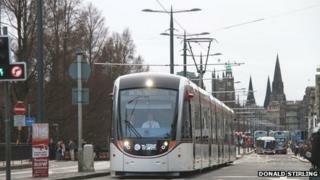 Edinburgh City Council said it is on target to get the trams fully operational for the public by May. Lesley Hinds, Edinburgh City Council's transport convener, said: "As well as driver training and system testing, this vital pre-launch period gives us an opportunity to test out various scenarios in a controlled manner so that we are as prepared as possible before we embark on tram passenger services in May." She added: "This exercise on 13 March will help us to see how the system copes with crowd numbers getting on and off the trams at Murrayfield Stadium, which will obviously be invaluable preparation for future match days." Tom Norris, Edinburgh Trams director and general manager, said: "All major public transport systems undergo thorough scenario testing before they go live and Edinburgh Trams has already carried out a wide range of these types of exercises. "At Murrayfield Stadium on match or event days, we're looking to ensure we have the best possible procedures in place to manage crowd numbers on to the system." Volunteers needs to register by sending an email with their name to Document.Control@edinburghtrams.com by Monday 10 March. Volunteers will also ride on the tram.